So Sidney Crosby secured his first, and probably not last, Rocket Richard trophy as the NHL's top goal scorer on Sunday with a two goal performance against the Islanders to close out the season. The two goals upped Sid's season total to 51 and temporarily had him alone on top. But before the night was over, Steven Stamkos was able to get himself an empty net goal to bring him back into a tie with Crosby and a share of the title. 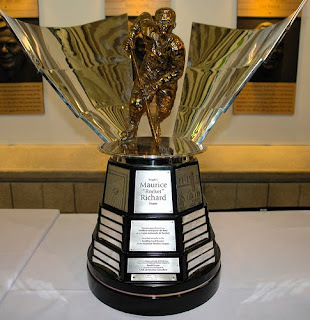 Now a lot of people are upset that Stamkos has to count on a "cheap" empty net goal to get his share of the Rocket Richard trophy. But there are several reason why everyone should be very satisfied with how the race for the goal scoring title concluded. Ending up tied with Stamkos only accentuates the extremely high level of class and integrity the Sidney Crosby plays at. Two games earlier against the same Islanders, Sid seemed to have scored his 50th of the year when his shot bounced off of someone in front of the net and went in. After exceedingly long deliberation, the off-ice officials gave the goal to Crosby. But after the game, the goal was changed to Guerin. After several looks at the replay, it is probably the correct call. None were conclusive, but it was still probably right. But Crosby was the one telling the officials that Guerin has scored the goal. Everyone knew hos big that goal was. I have no doubt that Guerin knew it had hit him, but kept quiet so Sid could get his 50th. But Crosby did not want it that way. He didn't want a goal that he didn't deserve. And that shows class and integrity well beyond his years. Had he allowed the goal to stand, Sid would have ended up with 52 and sole ownership of the title. But it would have been tainted. Sid knew that and getting a share of the trophy, honestly, is much more gratifying then having it alone with a question mark. Steven Stamkos plays for the Tampa Bay Lightning! This guy has been just amazing this season putting up 51 goals on a team that ended up real close to the bottom of the conference standings. This team still has a lot of talent, but this second year player completely took control of this team. Stamkos' 51 goals was 22 more then the next closest person on his team. He had 24 PPGs this season. The next closest lightning player had 7. All season long, all of the talk in the league is about the match-up between Crosby and Ovechkin, but real soon the rest of the league is going to have to stand up and take notice of this young player. If the scoring title is to be shared with another player, Stamkos is a worthy adversary. Ultimately, these two young leaders of the NHL sharing a trophy of this magnitude is good for everyone. Imagine if Lemieux and Gretzky had ever had a goal race like this. It would still be the talk of the league. Also, I have to imagine that this will only make both Sid and Stamkos even more determined to get ahead of the other and win this themselves. Which only makes for great hockey next season and for many seasons to come.